Autoruns for Windows download latest version free here. This utility, shows you what programs are configured to run during system bootup or login, and when you start various built-in Windows applications. These programs and drivers include ones in your startup folder, Run, RunOnce, and other Registry keys. 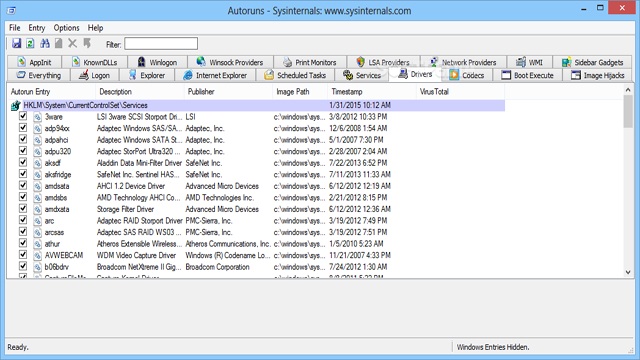 Autoruns reports Explorer shell toolbars, browser helper objects, extensions, Winlogon notifications, auto-start services, and much more. Autoruns is way better than other autostart utilities. Delete item : applying this menu item on any line will delete the registry key so the executable will never start again after system start.